Their first release “Goodbye School/Goodbye School (Inst)” (BR-55296) made sufficient noise in and around Philadelphia for Brunswick Records to release a second 45 “Everything’s Wrong/Don’t Trust Him” (BR-55307), a cover version of the Chubby Checker song from the previous year which become a local hit for The Cooperettes. The Cooperettes third and final Brunswick release was to be the Harthon Productions produced dance theme song “Shing-A-Ling/(Life Has) No Meanings Now” (BR-55329) a 1967 release that would later through its instantly recognizable drum roll introduction become an all time classic within the UK Northern Soul Scene. Sonny Hopson would later secure the girls a second recording deal with a major label with the 1968 Morris Bailey penned song “Trouble” gaining a release on the ABC label, released twice with different flipsides, “Peace Maker/Trouble” (45-1156) and “Spiral Road/Trouble” (45-1197). 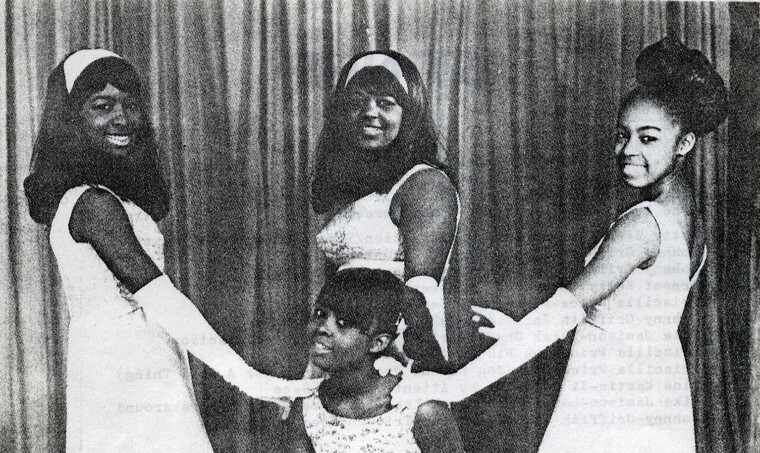 The Cooperettes final release would be the1971 mid-tempo crossover outing “Win All Your Love” b/w the sister funk dancer “Satisfaction” released on the IDB label (I-D-B 1007). The I and D being the initials of the former label owners christian names the late Irving Neiburg and Danny Odom. Danny Odom was also the former manager of the Philly hit group The Intrigues of “In A Moment” fame with the B in IDB being taken from the local label name Bullet which The Intrigues hit “In A Moment” was first released on.The youngest Cooper sister Tina would later marry Danny Odom. The Toppiks were an all male vocal quartet featuring Theodore (Ted) Mills, Charles Henderson, Ronald Nelson and a fourth member only remembered by the name of Chuck. As the Toppiks the group recorded a solitary release the sweet sounding “Give It A Chance To Grow/Surrender” (Larsam 12739) with Larsam being derived from the two owners, Sam Reed and Philadelphia Deejay Larry Daley’s christian names. Both songs were written by R.E.Whitfield, Sam Reed and Ted Mills. Sam Reed being the respected Jazz saxophonist and one time leader of Philadelphia’s revered Uptown Theatre’s house band. Sam also produced Patti LaBelle & The Bluebells 1969 recording “Loving Rules” (Atlantic 45-2629)a song written by his former his wife and Bluebelle’s member Sarah Dash.